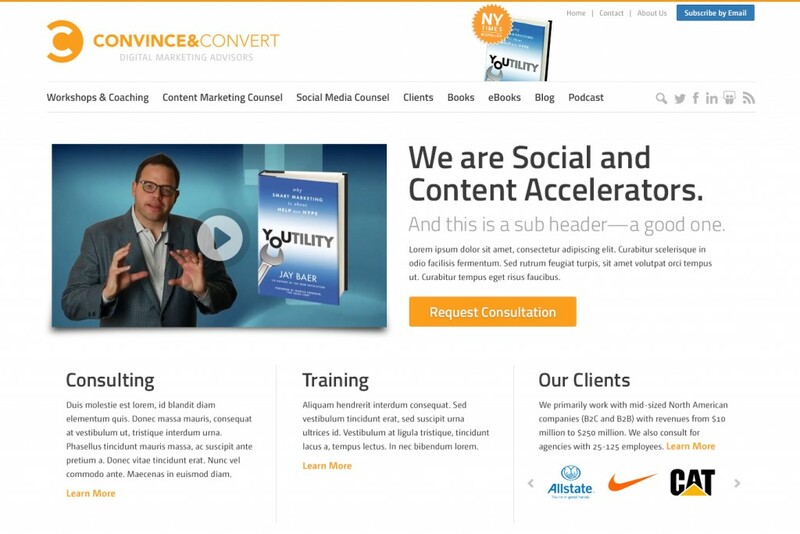 What Do You Think of the New Design for Convince and Convert? As the “original” Convince & Convert team member (I’ve been working with Jay on C&C since 2009), I have a unique look into the evolution of this company – one that started with a single political-science-major-turned-social-media-expert and has grown into an 8-person virtual powerhouse. In the beginning, Jay was blogging at least 4 times a week, every week. 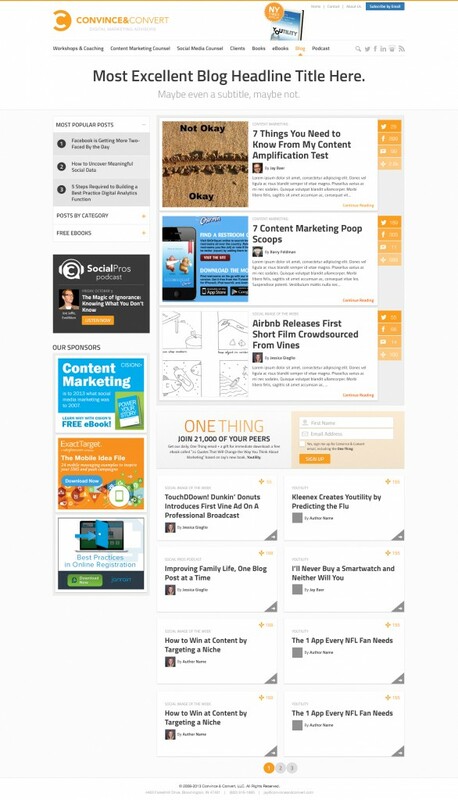 The site was a place for social media and digital marketing musings. Soon, readers took an interest in guest blogging, and the topics we covered grew deeper – public relations, case studies, email marketing, metrics, and personal branding all came into play. Now, we’ve got a 5-day-per-week posting schedule that includes a guest blog spot, a visual spot (Social Image of the Week), a video spot (Baer Facts), a podcast spot (Social Pros), and, of course, a special spot for Jay. Convince & Convert is no longer just a blog; we are a speaking company, a consulting company, and a relationships company. We help take the guesswork out of social media strategy and implementation, we teach the benefits and tools to create outstanding content, we inspire companies to become a Youtility, and we have a lot of fun doing it. As a result, and because our website is our main hub, we’re working on a new look that we hope will better service our clients, our readers, and anyone else who stumbles upon our website. 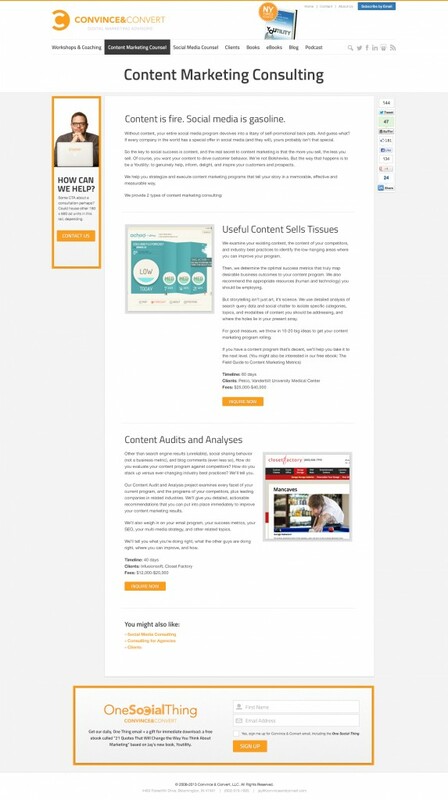 Instead of focusing solely on the blog, we wanted to showcase the services that Convince & Convert can offer, including our consulting, training, and speaking services. 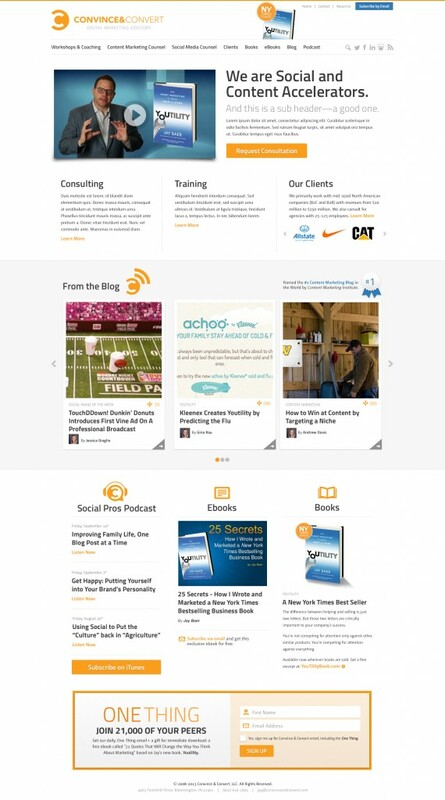 We also wanted to have a special place for our longer form content, like the Social Pros Podcast and ebooks. In addition to this site, we’re also working on a new look for Jay’s personal site which showcases his books and speaking. We’ll be launching that site shortly after the ConvinceandConvert.com release, so stay tuned for an official announcement. These are still a work in progress, but we’d love to hear what you think about the new design. We love constructive criticism and can’t wait to hear your thoughts!